From Victoria BC’s Driftwood Brewing comes the “Lustrum Wild Sour Anniversary Ale” the 4th release of the Bird of Prey Series and the 5th Anniversary ale. The brew poured a blood red with a red head. The aroma consisted of tartness, fruity black current and oak. The flavour is of oak, black current, tartness, bitterness, some alcohol warmth and a bit of a bite in the finish. The alcohol content of this brew comes in at a big 9.4%. This beer is great but will do really well if aged for a bit longer. 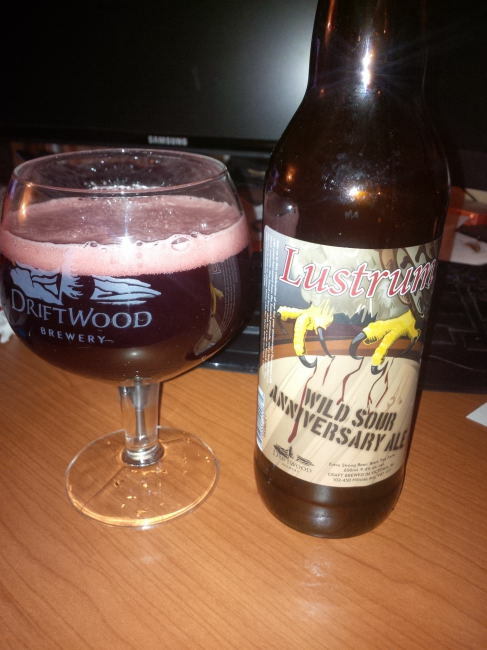 Commercial Description: Lustrum Wild Sour Ale pushes the perception of what beer can become! Lustrum is our 4th release from our Bird of Prey series and commemorates our 5th Anniversary of crafting beer in Victoria! Aged for over a year in French Oak this blood red vinous beast holds depth of colour, flavour and aroma unparalleled in any beer we have brewed thus far. Fermented with locally sourced wild yeast and a copious load of black currants, Lustrum will be enjoyed on many levels! In ancient Roman times the Lustrum represented a 5 year period. Driftwood Brewery has sacrificed the contents of 18 highly prized barrels of this sour beast for your enjoyment and to help us celebrate an amazing first five years! Cheers! This entry was posted in Barrel Aged, Imperial, Sour Ale and tagged alcohol warmth, anniversary ale, bc, beer, bird of pray, bite, bitter, bitterness, black current, canada, Driftwood, driftwood brewery, lustrum, oak, tart, tartness, victoria, wild sour ale. Not really a proper vertical with birds of prey as all 4 are different sours. This beer was probably the most rough early but may become the best of the bunch down the road. I love sours! why in small amounts? Drink the whole bomber of it haha. Sours and Malty beer are amazing aged for sure! Aha! So they did do a sour this year, and they did intimate that they also had an anniversary ale coming. Guess they chose to kill two birds with one stone, huh?